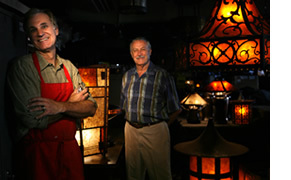 The Mica Lamp Company has been in business since 1991, Our shop is located in Pacoima, California. All Coppersmith lamps and fixtures are made in our shop. Our Circa 1900 lamps are authentic in style, materials and craftsmanship. Most models are styles from American Arts & Crafts era: Also, referred to as Mission Style and Prairie Style. Other styles are Mackintosh (European Arts & Crafts Style), French Galle' Style (Etched Glass Cameo) and 1920's forged black iron (Gothic, Tudor, and Spanish Styles). We use authentic materials, circa 1900. We specialize In forming copper. We are the leaders In authentic copper and mica mineral forming technique. We follow the same formula as the early 1900's original craftsmen: producing authentic hand riveted copper lamps that are finished with the old time patina process. Shade panels are made of authentic Mica mineral. The Los Feliz lamps and fixtures are made of hand forged black iron. New York International Gift Fair Tradeshow.